The Half-InchModem™ measures only 1.0” x 1.0” x 0.3”. This feature-rich modem module family is fully self-contained including built-in data pump, modem controller and on-board International DAA. This complete solution provides system engineers the flexibility to include modem functionality in system products with minimal engineering resources. Standard features of the modem include data rates from 300 up to 56 kbps, 14.4 kbps fax rate, voice playback and recording. The modem also provides enhanced features such as Caller ID, Extension Pick-up detect, Remote Hang-up, Quick Connect (V.92 models) and DLG (Digital Line Guard) protection. 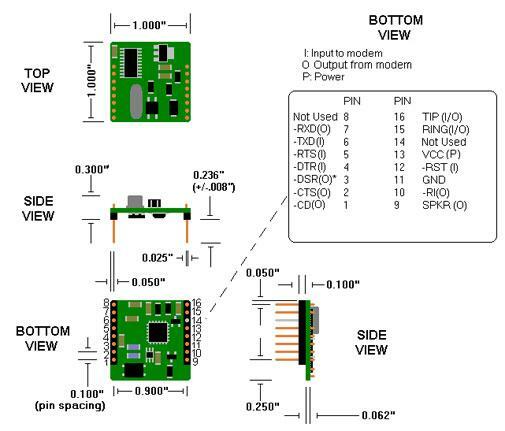 Dimension of the modem without enclosure - 1.00" x 1.00" x 0.30"